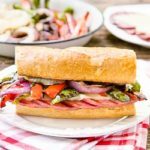 Fire up the grill to make this Grilled Salami Sandwich with provolone cheese, onions, and peppers. It's a feast of Italian flavors. Seed and cut bell peppers into 1/2-inch wide strips. Slice onion into at least 1/4-inch thick slices. Place vegetables in a large casserole dish. Drizzle with olive oil and sprinkle with salt and pepper. Toss to coat vegetables with oil (be careful not to separate onion rings). Place vegetables on grill in a single layer. Close lid and grill for about 3 to 5 minutes, until bottom side has grill marks. Turn vegetables over. Close lid and grill for another 3 to 5 minutes, until bottom side has grill marks and vegetables have softened. Place grilled vegetables in a bowl or casserole dish and cover with foil to keep warm. Slice baguette in half horizontally then into thirds (to make 3 sandwiches). Brush cut sides of bread with olive oil. Place cut side down on grill. Remove bread from grill when toasted, about 2 minutes. Watch closely so bread does not burn. Place salami on grill in a single layer and grill for about 1 or 2 minutes (salami will cook fast). Turn salami over and arrange 4 slices into a row the length of the cut bread (you will have 3 rows of salami, 4 slices in each row). Top each with 2 half slices of cheese. Grill until cheese melts. Place salami and cheese on bottom half of bread. Top with grilled vegetables. Drizzle Italian dressing on vegetables. Cover with top half of rolls.